The National NeedleArts Association, (TNNA), is a business organization dedicated to supporting the needlearts community. They need your advice and opinions, whether you are a beginner or an expert! This survey is only conducted every few years. Please complete the 2010 NeedleArts survey at www.NeedleArts2010.net . Your input is very important and will be included in a published national report. Ensure stores and suppliers provide what you want. Advocate for more programs to support the needlearts, such as Helping Hands Needlearts Mentoring, Stitch N' Pitch, and Stitching for Literacy. As a thank-you for completing the survey, The National NeedleArts Association (TNNA) is offering the chance to win one of five $100 needlearts store gift certificates. To enter the sweepstakes simply fill out the survey at www.NeedleArts2010.net and then click on “Sweepstakes Entry” on the page you see after submitting the survey. The 10-minute survey asks about your experiences with the needlearts you enjoy: crocheting, cross-stitch, embroidery, knitting, or needlepoint. Let us know which types of projects you prefer, the kinds of new products you want, and what you’d like to see needlearts shops do better. The survey is sponsored by The National NeedleArts Association. Hart Business Research is conducting this survey for TNNA and compiling the results into a major national report, The State of Specialty Needlearts 2010. Please complete the survey right away at www.NeedleArts2010.net . Survey closes April 19, 2010. Get ready! He's coming your way. Yes, some of you will be receiving the next Halloweenie character in a matter of days. Please remember to make a good color copy of the canvas before you mount it on bars. I think he measures 10 X 14. So check out your stretcher bar stash. Please read the entire guide before you begin. Amy has not necessarily written the guide in stitch order. Though I will start with the background as she has written first. I think one of the coolest things about this canvas is what Amy has done with the cat. We will talk about it as the month of April progresses. I'm anxious to hear what you guys think about her clever idea. I have fallen a bit behind on Stirha. I am off the next two days and I will get as much done as I can in those two days. But I won't let that make me hold off on starting Frank. You guys do the same. If you can, go on and mount up Frank because there may be some fun stitches you would enjoy doing. We will be using a lot of the threads we have been using on Stirha. You should keep the threads for the house separate as they will reoccur on the house and not the characters. One more thing. The printed guide is 12 pages long. Then the diagrams start on a page 11...so you have two page 11's and two page 12's. NOT TO WORRY. It is not a problem. Amy never refers to page numbers, just to diagram numbers. So don't let this be a concern. I'm off to work on the beads. Happy stitching! Here's an update on The Floating Cat. I finished the Background and the White Stars. 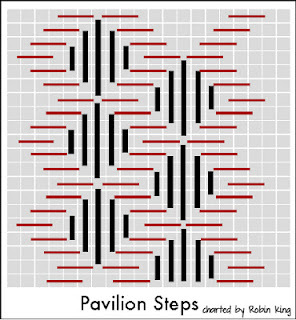 I chose the Pavilion Steps stitch for the background, as seen in SuZy's Portable Stitches, page 40. I liked the movement of the stitch and hadn't used it before. Plus, I am still planning some drama for the Pumpkin Balloon and the Floating Cat. I used 2 strands of Needle Necessities Inc. 113 (from my stash) and stitched over the Balloon's String. I will put that in later. The White Stars were Basketweave Stitches using Petite Sparkle Rays PS21, and the Outline of the Stars were Fly Stitches using Sprinkles 16. I probably don't need to mention that I have a "healthy" stash. 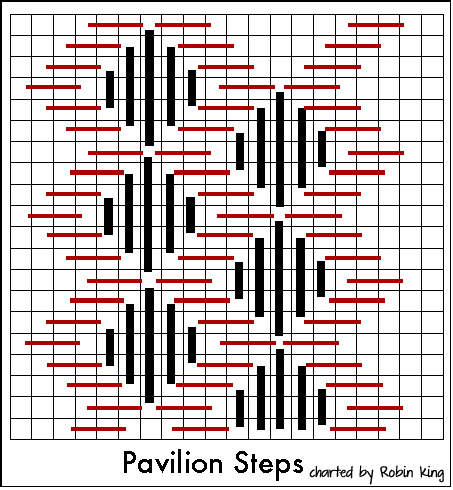 I am posting the charting of the Pavilion Steps for you to see; the regular way and my new favorite way. Here's my story. The other day I went into the local book store and saw some new Graph Paper. It is called Whitelines from Sweden, and it is a new writing paper which "brings out everything you write and draw. The novelty is that the lines are clearly visible without disturbing what you write, which a traditional writing paper with dark lines does." I purchased a binder of Whitelines Squared for myself. Love it. 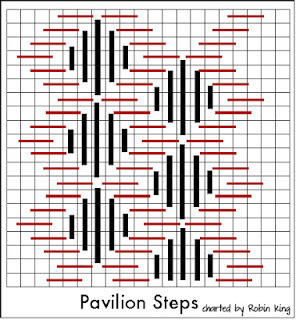 So this morning when I was charting the Pavilion Steps, I did so two ways: dark lines and White Lines. You can see for yourself the visual difference. What's next? The Pumpkin Balloon. I have recommended the technique to many. It's time I do it for myself. Enjoy the day. Hi. Just trying to wrap up the things I skipped...hair, beads and logs. The husband is under the weather so I may be out of pocket. Keep stitching! I have it on good authority, (Jill), that Frank N. Stein has just about finished packing his bags. He wants to get an early start to Canada and California. He heard that Stirha fooled around and arrived late to some homes. He doesn't want to have to spend the night in customs or some warehouse for several nights. He is determined to arrive promptly and begin stitching. He thinks he has the best outfit to stitch. But he hasn't seen Brid Z. Illa. She is a sight...well, just a sight. I am so proud of Melinda. She will be finished with Stirha A Cauldron in just a few days. She worked a little on it every day. Melinda, you are an inspiration. In case you haven't noticed, I skipped ahead to the bottom of the canvas. The guide is not necessarily written in stitching order. So I will go back to the cauldron, hands, hair and fire. Here are some pointers on the spiders. I think my are a little large, but I'm keeping them. Just don't get carried away wrapping the spokes. Then on the legs. I stitched the top and bottom legs first in order to get the spacing right. One trick I noticed after I was finished that keeps the spiders looking the same is to make sure there are five green threads between the two bottom legs. Two of mine have like seven threads but they are still scary. Now on to the rat. Make sure to follow diagram 35 for this. You may have to cover one of the green tent stitches near his rear end to follow the pattern. That is ok. Just lay your stitch over it and keep going. Amy has charted out the face of the rat very nicely for us. Follow that chart. After you have finished the charted diagram there will be some silver threads showing to the left of his face. Go back and stitch these in the background color. It makes his face really cute and tiny. And don't forget to stitch his whiskers. I have not yet added the dreaded bullion stitches for his ears and the gecko's tails. I am still practicing them on another canvas. They may be the last thing I do on all of the canvases! Maybe I can get a private lesson from Amy on making bullion knots. Robin is right. It was a wonderful day here in Memphis. My stitching station affords me the pleasure of looking out into our backyard. The daffodils are coming up around this garden figure made by my Mother-in-law. Isn't it sweet? I got a lot done today. And still managed to get my husband to take me out for dinner. I worked the bottom border. This is another case of "ignore the painted canvas". It is a fun and easy area to stitch. I used a size 26 Bohin tapestry needle to stitch the green corners so as not to open the holes to much. Then I worked on the green background that houses the geckos. I will make spiders tomorrow. Below you will see my helpers. I don't know if they are just sunning under the Daylight lamp or really interested in what I am doing. On the left is Joel and on the right is Ethan (I believe you have met Ethan before). They are named after the film makers, Joel and Ethan Cohen. Sometimes Joel sticks his paw down to where I am stitching. Ethan just sits and blinks his eyes. They are otherwise known as "the boys". I have been enjoying Peggy's Stitching. Looks like Stirha has put her spell on me. I will be posting soon. Stitch the belt in this order: First stitch the gold buckle following diagram 17. Look under the green crescent diagram at how the area is done in basketweave. Part of the buckle is covered up by her leg. I had to go in and put in more dress on the right side of the buckle, covering up a couple of gold intersections. Second, stitch the black part of the belt. Here it is with these two steps done. Third, stitch the crescent stitch as shown in Diagram 17. I learned all of this the hard way by stitching the belt buckle as painted. If you want the crescent to come out right you need to basketweave the gold under it as charted in Diagram 17, under the crescent numbers and lines. I sure hope this makes sense and you don't end up stitching it and then ripping it out like I did. (Loss of valuable time!) I think Amy's is a lot prettier than mine, but that's life. I may have pulled mine too tight. Try not pulling real tight and I bet your's will look great. The crescent is really fun to make when the gold is done right to begin with! I used a size 24 Chenille needle to do the crescent. Hello, I hope you all are enjoying our project. I have finished the dress except for the outline stitches between her arms and down her knee. The first time I thought I had finished the dress I took a long look at it and realized that the arms seemed to merge together. See the first photo at left. Look at her wrists to see what I mean. So I took out the dark thread and replaced it with the lighter. What a difference a few stitches make. The whole arm moves forward now in the next photo. When I add the outline stitches between the arms they will have even more definition. So play with the colors as you go. With the way the canvas is painted, and Amy's expert tips, we can give Stirha some nice arms. I wonder if hers jiggle like mine do now. What's up with that! As I said earlier, follow the chart for Stirha's face. I have still not added the bullions for her jaw and nose as I need more practice there. I have moved on to the dress because I love composite stitches. The deal with the dress is you have to break it down into sections. Amy's tip about how the dress drapes and how to change the pattern is very important. After you put the "shadows" in, stitch each section separately. I have put in the first step of the composite here. 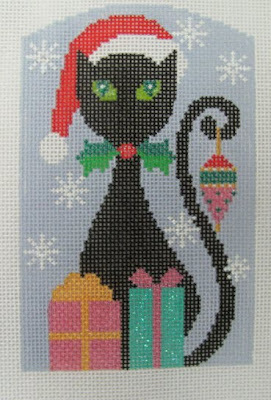 The painted green spots are not necessarily correct, so count them out from the diagram to set the cross stitch. 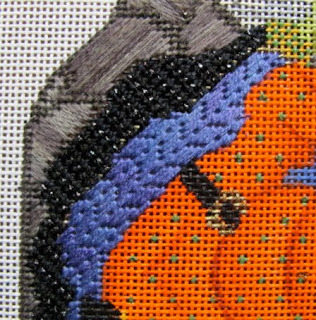 I will stitch the full composite stitch in the area under the belt and to the left of the solid orange lines first. After a couple of hours...here is the composite stitch for the section below the belt and to the left of the basketweave break in the pattern. Don't get to caught up in the shading. It will turn out pretty no matter what you do. That is the fun of overdyed threads. Thanks goodness for Amy's DVD #1, Tips, Hints and Knots. I have been practicing making bullion knots with the aid of the DVD. I am having success but not good enough, in my opinion, to put them on Stirha's face yet. 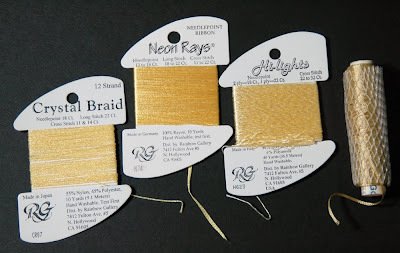 Amy offers a great tip for making bullion knots that I will share with those not getting the tip from the stitch guide. It is to use a Milliners needle. "The eye is very near the size of the shank of the needle necessitating very little loosening to slide the eye of the needle through the wraps." This works quite well. Now if I can just do it without poking myself with the sharp tip! Please make sure to follow the diagram for Stirha's face. This is one of those times when Amy would say, "ignore the painted canvas". I stitched by color till I realized some things were not coming out right. So be sure to use Diagram #8. With that being said, it is really fun to see her face come to life. Sorry I haven't posted in a few days. I plan to start stitching Stirha's face tonight, and hope to put in a lot of time on it tomorrow. I can't believe it is closing in on the middle of the month. I want to say hello to Barbara in Scarsdale NY. I spoke with her on the phone in the shop today. Barbara, I wish you lived down here so you could attend my Tuesday "Needlepoint Study Hall" at the shop. We work on what ever you bring in and need help with. If ever you are in town, please come visit the shop. We had two out-of-towners in the shop today, both here for the same convention, yet they didn't know each other. We had another out-of-towner in at the same time and they bonded like old friends. We stitchers think alike. They were talking about attending the ANG seminar and/or the Callaway Garden stitching event. The class schedule for both events are up on the net. I have attended neither but it sounds like fun. Well I have gotten a little more done on Stirha. I stitched the brim of her hat and the orange band on the hat with the little gold things. I love the overdyed thread we are using here. Take your time with the gold attachments. I did it twice as I wasn't pleased with it the first time. Make sure to use a chenille needle. Keep Stitching! Helen's Lace has become my favorite stitch. If you were to ask me why, I would say, "I don't know". It just makes me feel good. I first saw the stitch in "Categories For Needlepoint Stitches" by Julia Key H. Snyder. I was happy to see that Amy has included it in Halloweenies character #1, Stirha Cal-Dron. You can see that it is the lining for her cape. We will reverse the direction on the other side of her cape. That is another good thing about the stitch, you can reverse the slant for a different look. You can also see my rocks in this picture. I pretty much let the colors fall where they may as I did them. I took Jill's advice and planned out my slants before I started. Although I did change a few as I went along. And refer to the picture that came with the guide to see where it is good to do basketweave. That will be around the cauldron and the bird, and is explained in the guide. These areas will get some interesting layers later. I hope you are doing well. We would love to hear from you. I have finished the rocks and started on the cape. I love the stitch used on the cape, but it is hard to see using black thread on black canvas. I know that Kathy and Melinda have completed that section. Any tips Kathy or Melinda? I put a white paper in my lap to help see the canvas better. Some people put a light on the floor to help. I am going to try going outside and using that wonderful natural light to go back and put in the Kreinik. I have really enjoyed stitching my Floating Cat. My bountiful Stash has been helpful right from the start. The first thing I tackled was the Cityscape. Different shiny yellows & golds were selected to convey the windows' perspective to the viewer. Crystal Braid, Neon Rays, Hi-Lights and RibbonFloss were used. Why so many different threads you might ask? Remember Jane/Chilly Hollow's blog entry, Candy Cane Dog Stocking: Emphasizing What's Important and her quote from Melissa Shirley? "Threads that come forward are shiny, lighter and warmer colors, and heavier in weight. Threads that recede are matte, cooler colors and thinner in weight." I used the thinner Hi-Lights for a distant building; I used Neon Rays for a forward building. 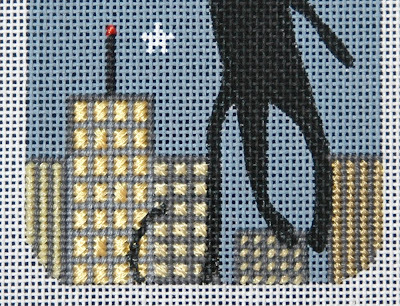 I also stitched in the (\) direction with the duller RibbonFloss for the building on the far right. Thanks, Jane & Melissa. Then I looked at my Gray Ring o' Stash and found some wonderful Impressions for the Building Outlines and Antenna. The Red Light shining beacon was Neon Rays. The final result was just what I hoped for: a Cityscape all lit up. 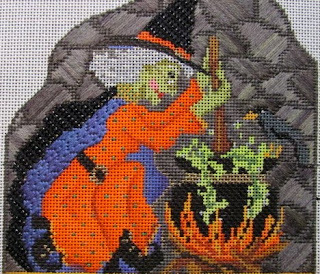 I found a great Thread & Stitch for the Background... I'll share those with you next time. I didn't have time to stitch yesterday. I will work on the rocks tonight. I just love Robin's floating cat. It reminds me of two canvases in the shop by Shelly Tribbey. I had to share them with you. There is a white one. It reminds me of a white cat in our neighborhood named Cotton. And of course with two black cats at home, how could I not like the black one. They would make great ornaments wouldn't they? They are not on our website, but you can call or email the store if you would like to add them to your collection! I will update you tomorrow on my progress on the rocks behind Stirha. And I hope to get started on the cape and hat. Keep Stitching!